Awakening the secret history of our sacred planet - A weekend workshop of spiritual adventure with Lucy Cavendish. "Many say these lands are the stuff of legend. Let me now tell you that they existed, and exist still. Here are their secrets, and what the planet has kept to Herself until now. The time when they will return with their knowledge...."
Why have these legendary names captured our soul's imaginations for over a thousand years? Because each of us played a role in their past, and will play a role in restoring their magic to our beautiful planet. In this beautiful workshop, Lucy Cavendish asks you to shed your doubts and join her on a magical soul pilgrimage through the planet's most mysterious and most powerful lands, societies and secret spiritual communities. 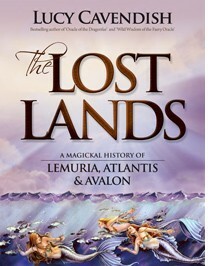 Thought to have been lost in time, Lucy will take you there, reveal their teachings, geography, location, traditions and messages for a modern world, and return you to the present armed with their knowledge, passion, wisdom and magic. Covering: Mu, Lemuria, Atlantis, Avalon, Ys, Lyonesse and featuring important details about Sumeria, and off world civilisations. Lucy will go through location maps, descriptions of the societies and their peoples, their sacred teachings, their Secrets, and conduct exercises on their individual magicks and meditations and guided visualisations to assist in connecting with them.